The McGill Daily (MD): Can you speak a little about your goal of transforming the environment in which music is experienced? Juan Sebastian (JS): Within the history of classical music, audiences have been expected to follow a certain protocol. We know how we are supposed to behave, and we aren’t supposed to talk. One of the first things I want to do is challenge those conventions. These parameters affect the way in which the audience interacts with the musician. When you invite people to a concert in an unconventional space, they start to wonder what it will be like. It becomes a whole experience from the moment people show up and bring a bottle of wine, to when they start meeting new people and interacting with the musician in this intimate space. Finding unconventional spaces is about challenging the tradition of conventional concert spaces and their use, while still keeping the high quality of music. The feedback we received from the first “Mira” concert was incredibly positive. From professional musicians to younger listeners, it was a great way to reach different audiences and different people. 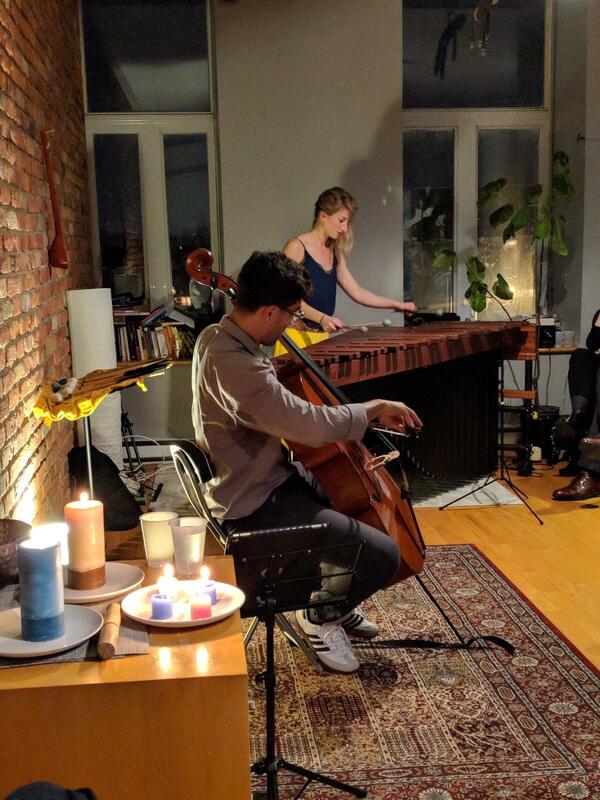 It’s always a nice evening, and it’s enhanced by the intimate connection with the music, which can be hard to find in more traditional spaces. MD: There can be a false sense of intimacy in listening to music because of YouTube or Spotify. Nowadays, it’s harder to find actual intimacy within a musical environment. How does “Mira” work to change this? JS: In the past, music was enjoyed and performed in small salons, with few people. The only way to experience music was to have live performances, and we didn’t have large auditoriums. With “Mira,” we are not presenting something new – within the context of this century it is different, but it connects with the roots of how music has been historically experienced. I think people respond so well because you have a performer presenting a contemporary piece, and they are right in front of you in such a friendly environment, and that allows people to appreciate something that perhaps could be intimidating to them in a different setting. When music is formalized by an institution, it can alienate a lot of audiences. “Mira’s” aim is to make the spaces in which music is consumed more accessible. Classical music, specifically, has historically been a classist, Eurocentric, and exclusionary art form. MD: When you were first thinking of hosting these events, were you aiming to target new audiences, allowing music to reach people who wouldn’t necessarily approach it on their own? JS: Absolutely, that is one of our main goals. Even as a performer, with my duo, we dress a bit differently and play music that is aimed to resonate with younger audiences. As a young professional, I want to play for people my age, and usually, with the classical music I perform, the audience members are 60 or older. There’s nothing wrong with that, but music should be accessible for everyone. This depends on how we present it and bring it to people – that’s a key aspect. Fundamentally, people are engaged in the experience and not in the concert series. It’s not like we say, “we have this performer, and he is famous because he won these completions or has these awards.” It goes beyond that, we try to welcome performers of different musical backgrounds and social statuses. Within the history of classical music, audiences have been expected to follow a certain protocol. We know how we are supposed to behave, and we aren’t supposed to talk. One of the first things I want to do is challenge those conventions. MD: Classical music is often regarded as something for older people that should be played and consumed in a very conservative way. How do you fight against this perception? JS: I keep this in mind always – how can I make the art accessible and interesting without losing its value? There is a fine line that can be crossed – I mean you could do a cover of “Despacito” with a cello and get 34 million views. That’s fine, but that’s not what I want to do. I want to offer a product that has some value, and on top of that I want to have my own voice as a performer. First, having unconventional spaces and finding people to play for is already a step forward in connecting in a meaningful way with your audience. In terms of performing, we are often not able to choose what we play. Many times I’m told what the repertoire is, and we have to make a living. However, when I have the opportunity to play with friends, for example, with my duo, we try to portray a younger image, even if we play classical music. I wear a baseball cap and a t-shirt, but I play Bach. I’m trying to make the music less intimidating and exclusive to people who can’t identify with the conservative, exclusionary image that classical music often has. I also don’t want to wear a suit and bow-tie in all black, I don’t connect with that image either – I would like to play for people my age. So, with my duo, we select a repertoire based on our own musical tastes and interests. We find a balance, without losing a sense of where we come from as classical musicians. As a result, we can perform mixtures of classical and contemporary composers and present it in ways that are more appealing. It’s not only with our image, like me wearing sneakers, but also with regards to the refreshing musical content of what we play. It’s interesting and provides the audience with a sense of us going forward, but also telling them where we are coming from. Check Stick & Bow’s website for information on their upcoming shows: stickandbow.com.